After taking a look at center fielders and designated hitters yesterday, our positional power rankings continue with shortstop. We’re in a golden era for shortstops. The late-1990s/early 2000s heyday of Alex Rodriguez, Derek Jeter, Nomar Garciaparra, and Miguel Tejada was not only pretty cool — at least before injuries and position changes broke up the band, and PED revelations retroactively dimmed our appreciation — but it ushered in an era of bigger, more powerful players at the position, and that trend has raised the bar for offensive production. Last year, shortstops hit a collective .259/.317/.416 for a 97 wRC+, five points higher than it had been in any other season since 2002 (as far back as our splits go), and trust me, it was worse than that previously, despite occasional concentrations of thumpers. In 2018, shortstops even outhit second basemen (93 wRC+) by a handy margin, something unseen within the narrow timeframe of our splits and constituting roughly a 10-point swing relative to the 2002-2017 period, in which second basemen outhit shortstops by a 95-89 margin according to wRC+. It’s true that last year’s surge was helped by the inclusion of Manny Machado — who led all shortstops with a 141 wRC+, but has returned to third base as a Padre — and Javier Baez. But the top two hitters for the position from 2017, Zack Cozart (!) and Corey Seager, missed most of the season, with the former playing more third base than second base as well, and even Carlos Correa wasn’t really himself. No, this is about the likes of Baez, Francisco Lindor, Xander Bogaerts, Trevor Story, Didi Gregroius, and even Jose Peraza — all of them 28 or younger, all but Gregorius 25 or younger — breaking out while offsetting the declines of Elvis Andrus and Brandon Crawford, the position’s geezers. More than ever, shortstop is a young man’s position. In 2018, nobody older than 31 (Crawford, Alcides Escobar, Jordy Mercer) made even 150 plate appearances as a shortstop. That trio all played at least 100 games at short, the lowest total of over-30 shortstops to do so since the majors expanded to 30 teams in 1998. As recently as 2016, there were six such players, and in 2014, 10; for the 1998-2017 period, the average was 7.4. We haven’t even talked about defense. Yes, these guys are selected primarily for their gloves and arms, but with the decreasing rates of balls in play brought about by increases in strikeouts and homers, teams can get away with a bit less leather all around the infield. 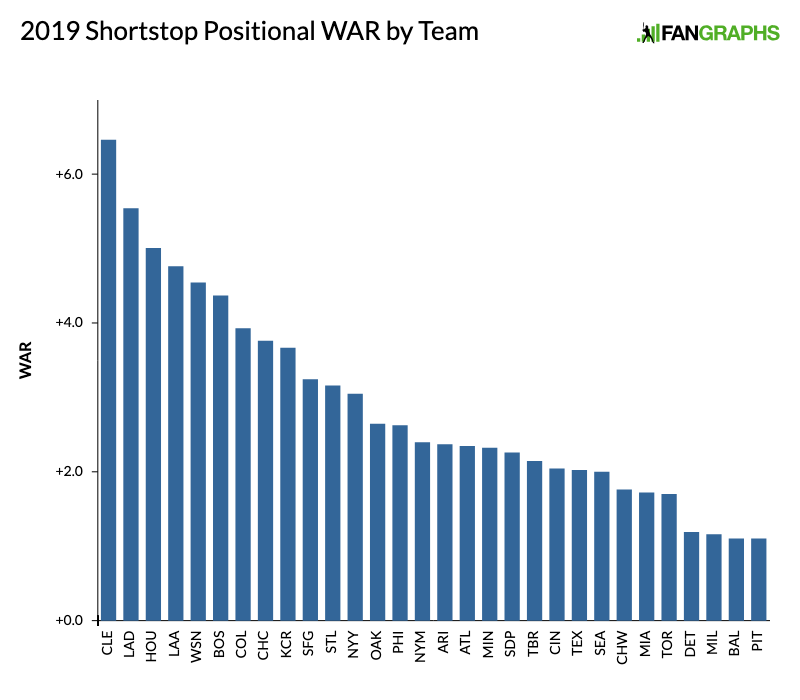 Even with a bit of decline in that area according to UZR (all shortstops were a net 2.8 runs in 2018, down from 20.6 in 2017), shortstops combined for 90.4 WAR, an increase of 18.2 over 2017, and 9.7 more than in the second-best year within this range (2016). The best of the current shortstops are still in their primes, and younger models, such as Willy Adames, Adalberto Mondesi, and Amed Rosario, all of whom are entering their age-23 seasons, are staking their claims to full-time play. Fernando Tatis Jr., ranked third on our Top 100 Prospects list and a babe of just 20 years old, will be up sometime soon. For as much as the current game has on- and off-field issues that need addressing, we should still savor the chance to watch this concentration of talent. We hoped you liked reading 2019 Positional Power Rankings: Shortstop by Jay Jaffe! Luke Weaver Is Working on a Cutter. Or Is It a Slider? Thank you Jay, very cool!